His well-timed and fluid footwork took Kobe Bryant many places. The Lakers’ star has slashed his way to the basket. He has pivoted all around the post and elbows. Bryant has used a series of jabs and cuts to throw his defender off balance. Such skills partly helped Bryant climb all the way up to third place on the NBA’s all-time scoring list. But that footwork apparently helped Bryant achieve something else. He apparently can drop-kick a full-court shot, as shown in his appearance on the FIFA 16 commercial. Bryant’s theatrics symbolized how so many can turn soccer into The Beautiful Game with how well they handle the ball with their feet. Soccer stars, such as Lionel Messi and Sergio Aguero, showed off their dribbling and shooting skills. Alex Morgan proved she can easily outplay any male players. Various citizens from around the world juggled the ball with ease. That left Pele and countless soccer fans cheering from the sideline. Bryant cheered too, marveling at how his fotwork (and some computer-generated imagery) produced another masterpiece. 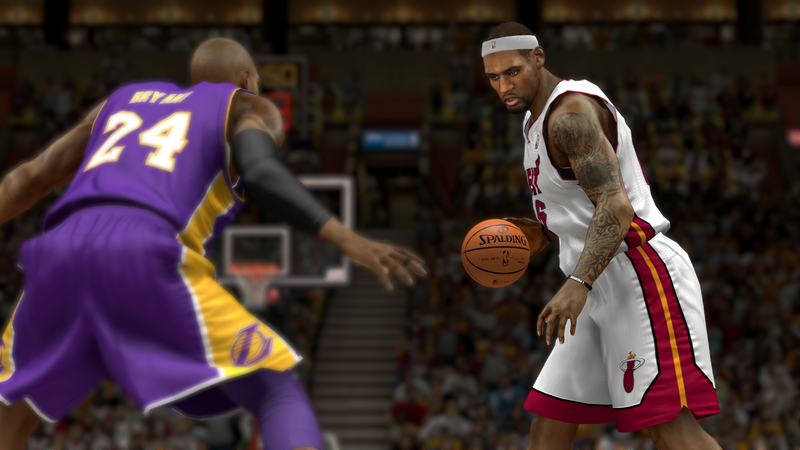 The Lakers: Who’s staying? Who’s going? It took nearly a season’s worth of frustration riddled with injuries and reduced playing time. But Chris Kaman has finally received his wish. He will start tonight with Pau Gasol when the Lakers (25-48) host the Portland Trail Blazers (48-27) tonight at Staples Center, a combination Lakers coach Mike D’Antoni has resisted for over four months. 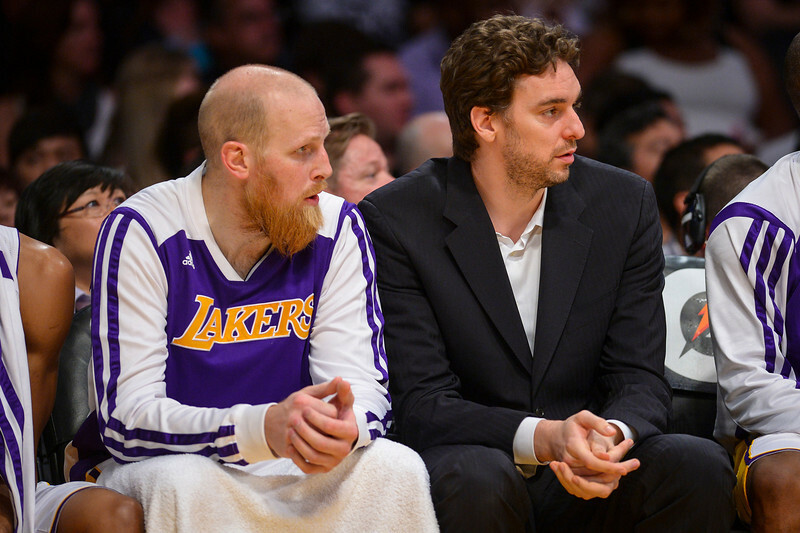 Kaman has shared his frustration on and off this season about his reduced role. But he took the diplomatic route this time. Lakers’ Chris Kaman (9) powers a shot over Jazz’s Derrick Favors (15) in a NBA Western Conference basketball game at the Staples Center Tuesday, February 11, 2014, Los Angeles, CA. After a sizable lead, the Lakers trailed at halftime 48-37. As they remain at the bottom of the Western Conference, the Lakers and Jazz have big-picture fortunes that may produce more clarity this spring. On May 20, the NBA draft lottery takes place, an event so foreign to the Lakers’ championship fabric that they’ve only been a part of two of them since the system’s inception 27 years ago. Yet, with the Lakers’ 96-79 loss Tuesday to the Utah Jazz at Staples Center marking the team’s sixth consecutive home loss and dropping them into 14th place in the Western Conference,that scenario becomes more and more plausible for the Lakers. Perhaps that marks the only silver lining for the Lakers, considering the never-ending injuries and defeats. But Lakers center Chris Kaman adamantly stated the team’s struggles represent a byproduct of never-ending injuries than a deliberate strategy to maximize the team’s chances at securing lottery ping pong balls. 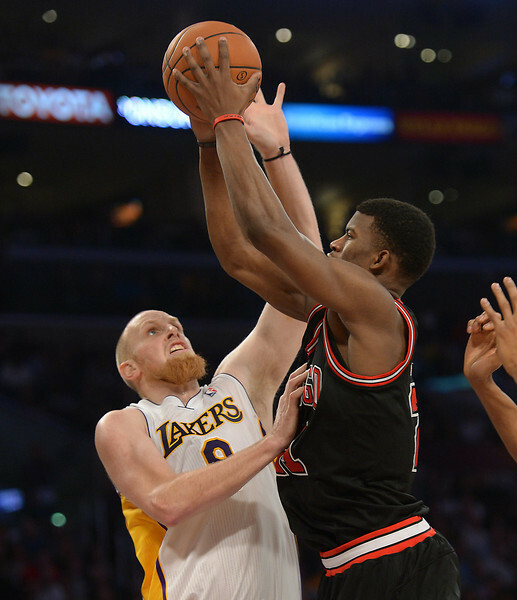 The Los Angeles Lakers host the Chicago Bulls in a NBA basketball game at Staples Center in Los Angeles, CA. on Sunday, February 10, 2014. (Photo by Sean Hiller/ Daily Breeze). 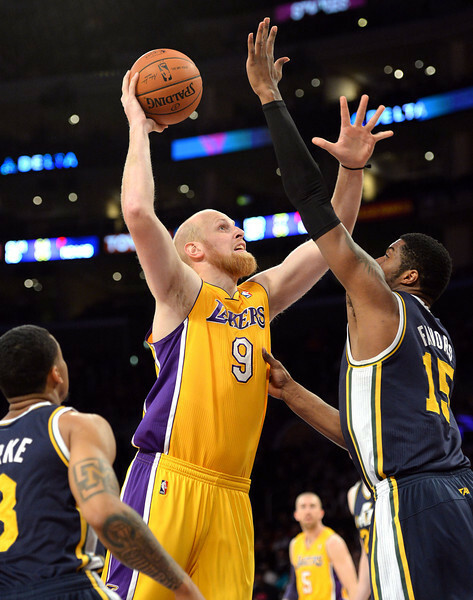 After spending most of his time on the Lakers sitting on the bench and making teammates laugh with unfiltered opinions, Chris Kaman will start at center when the Lakers (18-33) host the Utah Jazz (17-33) tonight at Staples Center. Kaman has appeared in only 27 of the Lakers’ 51 games this season, mostly because Mike D’Antoni has preferred Robert Sacre’s defense and Ryan Kelly’s floor spacing. After initially stating Kaman and Pau Gasol would have complementary offensive skillsets, D’Antoni also believes pairing Gasol and Kaman would become counterproductive. But with Gasol out with a strained right groin and Kaman posting a season-high 27 points in the Lakers’ 92-86 loss Sunday to Chicago, D’Antoni will pair Kaman alongside Shawne Williams. D’Antoni believes Williams floor spacing and toughness could offset some of the defensive limitations he attributes to Kaman. For what it’s worth, the NBA’s trade deadline on Feb. 20 remains a little more than a week away. Kaman has averaged 16.5 points on 56 percent shooting and six rebounds in 21 minutes off the bench through four games during Gasol’s absence. 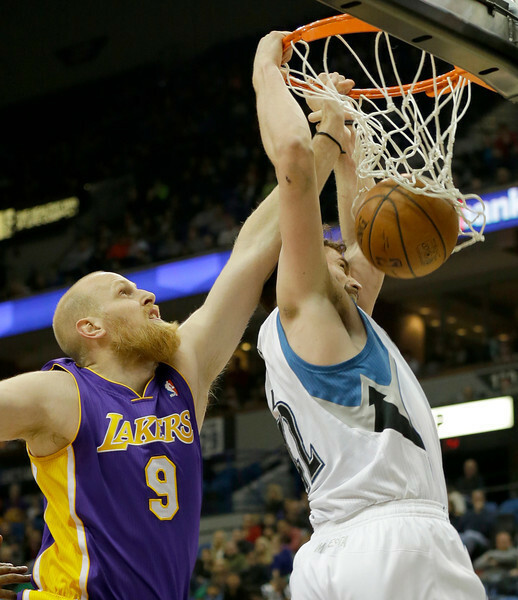 Kaman had also started five games this season, averaging 11.8 points on 46.4 percent shooting and 9.2 rebounds. But despite the Lakers signing Kaman to the mini mid-level exception worth $3.2 million, Kaman has mostly played a limited role. For once, Mike D’Anoni’s quest for small ball didn’t keep Chris Kaman on the bench. His early foul trouble did the trick. But with the Lakers appearing to coast to a double-digit win Wednesday over the Cleveland Cavaliers, Kaman took advantage of the team’s injury-plagued roster by literally taking all of their seats. 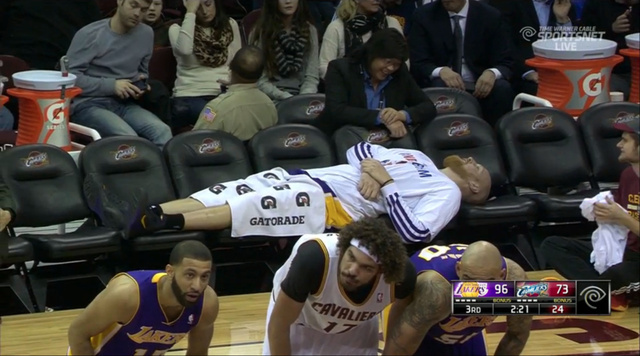 But Kaman couldn’t get too comfortable. Lakers center Robert Sacre also fell into foul trouble, while Jordan Farmar experienced cramps in his calf muscles. Suddenly, the man who can never seem to find time in D’Antoni’s rotation had to enter the game. The Lakers’ 119-108 win Wednesday over Cleveland wasn’t easy, though. After entering the game with 9:19 left in the fourth quarter, Kaman fouled out nearly a minute later. Sacre wasn’t penalized for his fouls, though. He picked up his sixth foul with 3:32 remaining. But per NBA rules, Sacre still stayed on the floor because the Lakers didn’t have any other healthy players. The only downside, the Lakers would receive a technical foul for any time Sacre fouls again. Lakers guard Steve Nash tried warming up, but he wasn’t on the active roster since the Lakers are sitting him on the second night of back-to-backs to preserve his body. Farmar had been icing for precautionary measures to ensure his previously injured left hamstring didn’t flare up again. But NBA teams can, providing a reminder that perhaps it’s best next time that Kaman keeps his shoelaces tied. The Lakers’ newly acquired big man remains a familiar name to plenty of Los Angeles fans. But for those in need of a Chris Kaman introduction, he brings many different qualities than Dwight Howard. Kaman hardly fits the defensive prowess that Howard possessed when he won the NBA’s Defensive Player of the Year award three in the past five seasons. Kaman doesn’t even match up to Howard when he was limited last season because of a surgically repaired back, and, the Lakers suspect, inconsistent effort led to diminished athleticism and mobility. Meanwhile, the Dallas Mavericks let Kaman walk after one season partly because of his defense. Howard has been considered the league’s best center because his athleticism allows him to overpower people. But Kaman bodes superior in his willingness to play pick-and-roll, post moves and reliable mid-range jumper. Not surprisingly, Kaman’s career 74.4 percent mark from the free throw line trumps Howard’s 57.7 percent clip. All those ingredients ensured Kaman averaging a career 11.8 points and eight rebounds and a lone All-Star appearance in his 10-year career, including eight seasons with the Clippers. Those qualities should also help Kaman mesh well with Pau Gasol, who became confined last season to a facilitator role along the perimeter partly because of Howard’s limited mid-range game.